A clean closet makes for a clean mind. For a closet that makes you feel balanced, calm, and organized rather than overwhelmed, frustrated, and stressed, consider a closet organization makeover that incorporates elements of feng shui. Feng shui is the ancient Chinese art of arrangement in relation to the flow of energy, known as qi, whose favorable or unfavorable elements can drastically impact your mood. In short, the environment you surround yourself with is important — and according to feng shui, it could even affect your fortune. 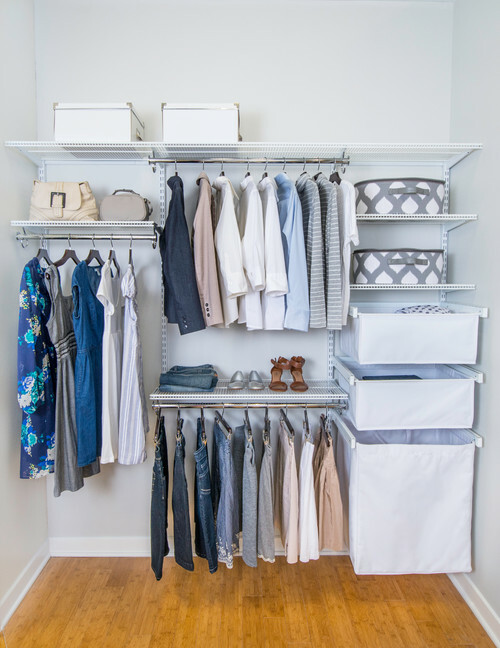 If your closet door is best left shut or rifling through piles of clothes is leaving you just a bit frazzled, here’s how feng shui-inspired closet organization can help. 1. Add some light and color. No one wants to reach into a dark and dreary closet. Energize yours with quality overhead and built-in shelf lighting, plus a fresh coat of paint. The color white in particular is believed to dial up your energy, channeling to mind the feng shui element of metal. 2. Get rid of broken hangers, worn-out accessories, and junk. While closets are ideal spaces for organizing and storage, sometimes they become receptacles for junk you’d rather not deal with. If this is your case, take some time to sift through your closet, asking yourself what you really need and what’s just taking up space. Take extra care to rid the space of broken things which are no longer useful. Replace them with long-lasting, high-quality products and leave the corners of the closet floor uncovered for easy cleaning and positive energy flow. At Strickland’s Closets & Home Organization, taking inventory is a key part of our process, and we’ll help you every step of the way. One of the greatest enemies of peace and harmony is clutter. A cluttered space increases your stress, overwhelms the eye, and oozes negative energy, say feng shui practitioners. For a more positive vibe, arrange clothing and items by how often you wear them (in the closet organization world, we call this the 80/20 rule). Don’t be afraid to leave some shelves empty or under-filled; open space allows for energy flow and much-needed lightness. Looking to lean into minimalism? Consider a Shaker-style closet. 3. Opt for a built-in laundry hamper. Don’t allow dirty laundry to accumulate in piles or towers throughout your closet. For a clean, clutter-free space, install a built-in laundry hamper. 4. Clear your mind with simple organization systems. According to feng shui, a disordered space can make for an increasingly stressful and negative state of mind. A beautifully organized space, on the other hand, can help you feel more calm and collected. De-stress your walk-in or reach-in closet with simple organization systems like built-in cabinetry, open storage, and baskets and boxes for loose items like scarves and accessories. 5. Add a touch of positive symbolism. A cluttered closet with a broken mirror and piles of clothing is a nightmare of negative symbolism. Add positive symbolism to your closet organization with photos of loved ones, flowers or plants, and even natural light if possible. Looking for more peace in your life? Applying the principles of feng shui to your custom closet organization is a fantastic place to start. If you’re considering a closet clean-out and makeover, contact us or come by our showroom at Strickland’s Closets & Home Organization. We’ll help you create more balance in one of your most-used spaces.